Field Marshal Khalifa Haftar, whose forces are battling to seize the capital Tripoli, is widely seen as a hawk hunting for greater power in violence-wracked Libya. White hair framing his stark black eyebrows, the 75-year-old former army officer presents himself as Libya's saviour in the face of a growing jihadist threat. But his opponents accuse of him of seeking to establish a new military dictatorship in the oil-rich North African country. 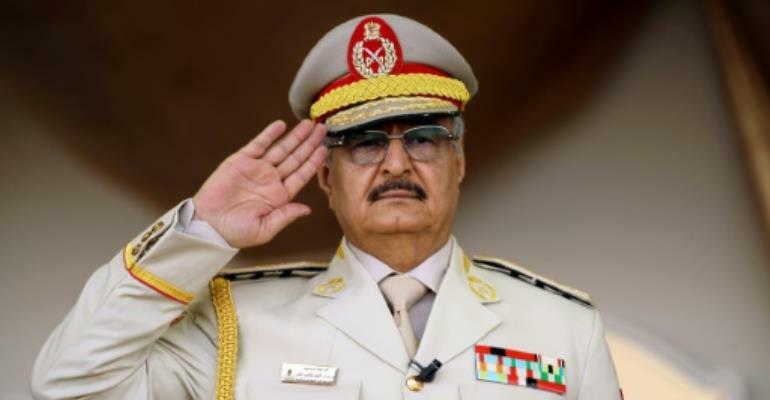 A controversional but key player in Libya since it spiralled into chaos after the ouster and killing of longtime dictator Moamer Kadhafi in 2011, Haftar groups all of his opponents under two labels: "terrorists and mercenaries". His self-proclaimed Libyan National Army launched an offensive this week to take Tripoli, seat of the UN-backed Government of National Accord (GNA) led by Fayez al-Sarraj. Haftar and his forces back a parallel administration in the east, and Sarraj has ordered GNA loyalist forces to prepare to "face all threats". Vowing to "cleanse" the country of jihadists, Haftar's forces pushed hardline militias out of the eastern city of Benghazi in 2017 after a deadly three-year battle dubbed "Operation Dignity". After being hospitalised in Paris for two weeks in early 2018, fuelling speculation about his health, Haftar returned to Benghazi to great fanfare in April. To reaffirm his military clout, he quickly launched a successful operation to oust Islamist militias from the city of Derna, which had been the only part of eastern Libya out of his control. They quickly overran the region's largest city and a major oil field without a fight, before turning their sights on the capital this month. Originally from Cyrenaica in Libya's east, Haftar received military training in the Soviet Union before taking part in the 1969 coup which brought Kadhafi to power. He served in Kadhafi's armed forces but fell from grace when he was captured by troops from Chad during Libya's ill-fated 1978-1987 conflict with its southern neighbour. After more than two decades living in the United States, where he was rumoured to be working for the CIA, in 2011 he returned home to take part in the uprising against Kadhafi. Critics say Haftar owes his military success to undeclared foreign backers including the United Arab Emirates, Egypt, France and most recently Saudi Arabia. Three French troops were killed in a 2016 helicopter crash in Libya while on an intelligence gathering mission for Haftar's forces. The UN-backed government in Tripoli called their presence a "violation" of Libya's sovereignty.